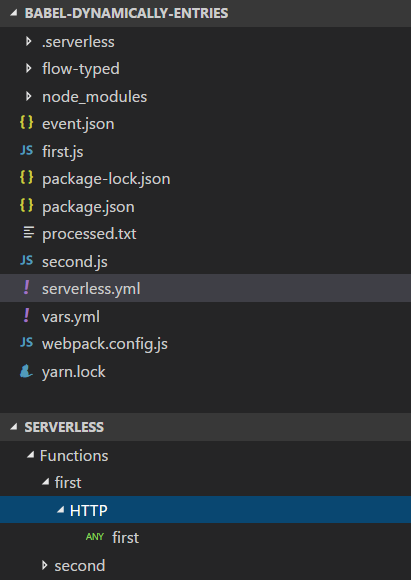 Visual Studio Code>Other>serverless-vscodeNew to Visual Studio Code? Get it now. Serverless integration. Lets you manage your service from within VSCode. This extension enables an integration of Serverless projects with VSCode. It eliminates the need to start Serverless commands from a separate command line. In order to install an extension you need to open the extension palette and search for serverless-vscode. You can then install it. This is currently an alpha version, that integrates only a subset of possible commands. See the GitHub repository for remaining planned features for the final version. You're encouraged to test the version and create additional feature requests. Currently the extension only supports Serverless projects with Serverless installed locally! That means, that Serverless must be a development dependency of the project itself. A subsequent version of the extension will also support the globally installed Serverless framework and a configuration for that. The extension supports user and workspace configuration. To access the configuration settings, open File->Preferences->Settings (workspace or user) and expand the Serverless Configuration node. When set to false (the default), the extension will not ask for the region to deploy to but use the one, set as serverless.aws.defaultRegion. This reduces the typing needed to execute a single command, as normally you'll not deploy cross-region that often. The defult stage that is assumed, if you just press ENTER in the stage input field when executing a command. The defult region that is assumed, if you just press ENTER in the stage input field when executing a command. See also serverless.aws.askForRegion. 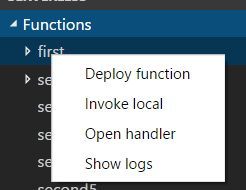 As soon as you have added a Serverless project to your workspace, you can select the serverless.yml in the Explorer tree view. 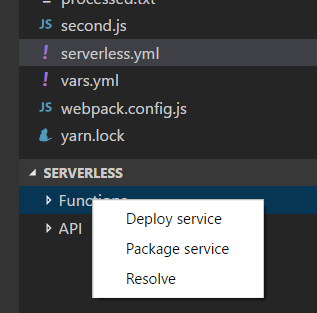 Then an outline is shown in the Explorer view, that shows the parsed structure of your Serverless service definition. The outline will contain a functions and an API hive, which contain the defined functions in the project and the defined API endpoint hierarchy. Each item in the outline has a context menu that allows access to context specific commands. Most of the command will ask you for the target stage when triggered. Each of the top hives has a context menu that lets you invoke service/project related functions. Package will ask for the stage and optionally region and packages the service with serverless package. Package will ask for the stage and optionally region and deploys the service with serverless deploy. Resolve allows you to show a generated resolved.yml, i.e. your serverless.yml with all Serverless variables resolved to their values for a selected stage. The functions hive lets you analyze your service function-wise and contains a node for each function. Each function then contains a list of all defined HTTP endpoints in the function definition. All function related commands of the extension can be called via the context menu of the function. Deploys the selected function with serverless deploy function. Attention: In general, single function deployment does not replace a service deployment. See the Serverless documentation for details. Invoke the selected function locally. The command lets you select an event.json that will be used for the local invocation. Setting a custom context is not yet possible. Retrieve and show the online logs of the deployed function in the output pane. Open the handler source file that is associated with the function. The API hive shows the combined API that will eventually be deployed to API Gateway.